It was just supposed to be a Christmas special. On a break between filming movie features for quick cash-ins to diminishing returns, Elvis and friends were plopped down in sunny Burbank, California in the Summer of 1968, and tasked by Colonel Tom Parker with working up a yuletide program for NBC’s fourth quarter programming. But producer Steve Binder was on the case, and he had other ideas. In the sixties, Binder was absolutely unparalleled in bringing the youth oriented Pop music to the screen, both silver and square. He had produced the legendary TAMI Show, which led to Shindig!, which led him to the plum job of bringing Elvis back to performing music on TV after a long absence. Never one to let an opportunity slide away, he went to work on E to get him to see that there was too much at stake to let this opportunity to shine be dulled by something so trite as an hour of Holiday fare. Despite Binder’s protests, Elvis didn’t care to deviate from the program set before him until one day when the producer challenged him unconventionally. He had been sending his lackeys up to the corner around from the studio to get burgers for lunch daily. Having seen first hand what the sixties had wrought, especially in California, Binder threw down the gauntlet and challenged the erstwhile King to go get his own grub. “Try it and see” was Binder’s response. Elvis brought back a sack of cheeseburgers and a new resolve. No one had stopped him, no one even gawked. It was the Summer of 68, and Elvis was nobody in Burbank. 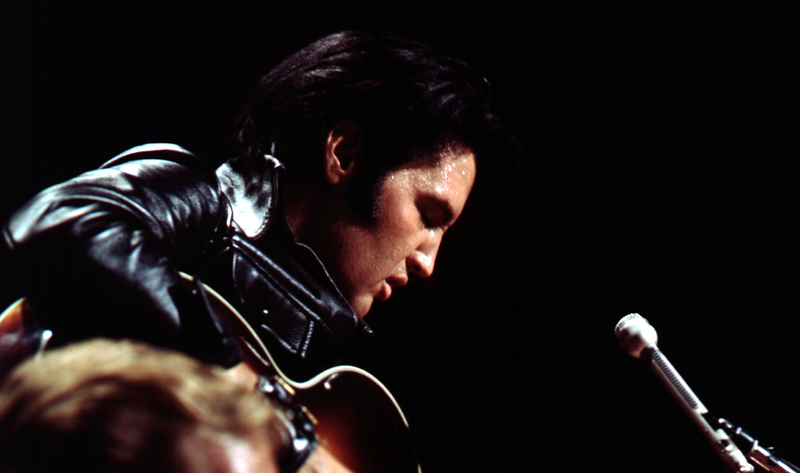 The show was simply called Elvis when it aired, but it’s retroactively known for it’s place in the Presley mythology as the 68 Comeback Special. It’s mainly made up of a few big Broadway worthy production numbers featuring nameless dancers doing most of the hefty lifting, hinting at a loose narrative of Elvis as “Guitar Man,” drifting from town to town. While I enjoy these segments for what they are, it’s the live musical concert footage that proved memorable. The favorite part of the show for most seems to be the bit in which Elvis, sitting in a circle on stage and reunited with his 50’s era cohorts Scotty Moore and DJ Fontana along with three members of his entourage, including right hand man and unrepentantly boorish loudmouth and sycophant Charley Hodge, bop through a few favorites from the first few years of E’s career. The music is solid, but the mood is not as extemporaneous as we are to be led to believe. This “informal jam session” had been practiced to within an inch of it’s life, every little off the cuff line the guys make was predetermined, and worst of all, Hodge seems to have a snippy axe to grind against Scotty Moore, taking every opportunity to belittle him. To put this in perspective, Scotty Moore was the guitarist on all of Elvis’ 50’s hits, from Sun to RCA. Charlie Hodge was introduced onstage by Elvis in the 70’s as “The guy who brings me my water.” Scotty Moore played guitar on Hound Dog, Charlie Hodge was in charge of scarves and keeping sweat off Elvis’ brow. No, my favorite part of the show is when Elvis is onstage all by himself. In an unusual set-up, he’s sent out on a small square stage, the floor of which is all glass over white lights with a border of red. The audience, mostly young ladies, surrounds him completely. Behind the audience somewhere is a full band. Instead of consisting of he standard guitar, bass, and drums, the band is that plus a lot of brass and back up singers, making for a very lush and full sound. With no one around to bail him out on his nervous energy or distract from his charisma, Elvis had no choice but to absolutely bring it. This was the moment that Elvis Presley became relevant again, and this was the beginning of what I feel is his most vibrant, important, and vital period.